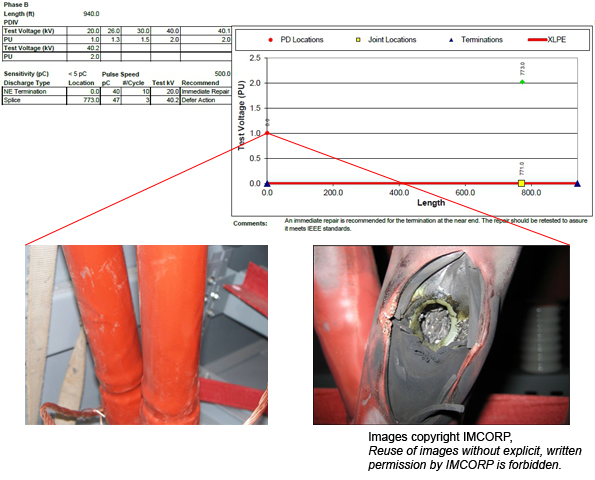 These images show the development of a medium voltage cable failure in an open-air heat shrink termination. The first image (left) shows the IEEE 48 non-compliant heat shrink at the termination that was located by the IMCORP's Factory Grade® technology that was recommended for repair. The cable system owner opted to forgo the repair, choosing to trust the results of a subsequent passing voltage withstand test. The cable was put back into service and failed four months later at the defective termination point. The second image (right) shows the cable system after the PD activity resulted in failure. During installation, the improper positioning and insufficient shrinkage of the layers resulted in a interfacial voids and a gap between the cable semicon cutback and the termination stress control tube. The semicon cutback area is the most critical part of a termination. This particular situation highlights IMCORP's ability to find defects long before they progress to the point of complete failure. It's worth noting that this is one of many examples where legacy test have failed to indicate an issue that IMCORP's Factory Grade® technology correctly identified.